La Pietá is composed of 5 separate films and 9photographs, that progressively deal with the shift from childhood to adulthood. A slow motion silent performance that plays with the iconography of the 14th and 15th century Christian paintings and sculptures, whereas the artist’s symbolic translation goes far beyond any religious context. The human and their emotions become the center of the narrative. The visual set up is pop, the storytelling nevertheless deals with voyeurism, sexual abuse and the symbolic of a medieval age key, that refers to the inner wisdom and pure childhood treasures and secrets that we all keep inside of us. … Part sculpture, part performance, Annina Roescheisen’s cinematic narration expresses the iconography of Christian painting from the 14th to the 15th century. Informing through images, translating the cycle of life and presented in five acts, the performing and staging of “Pieta” depicts the transition from childhood to adulthood, the construction of the self and the relationship between mother and child, like a series of single breaths before the world. 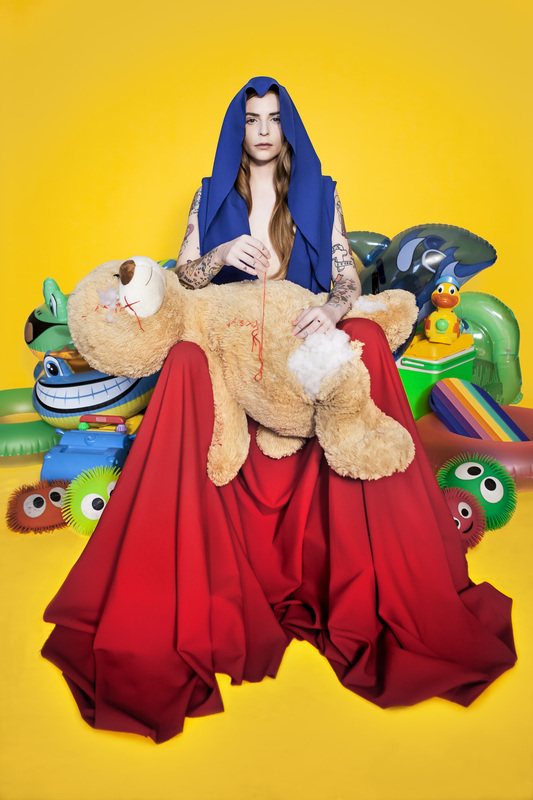 La Pietá deals with questions of childhood and adulthood, with identity, with the feminine, as well as with sexual abuse, voyeurism and childhood trauma.